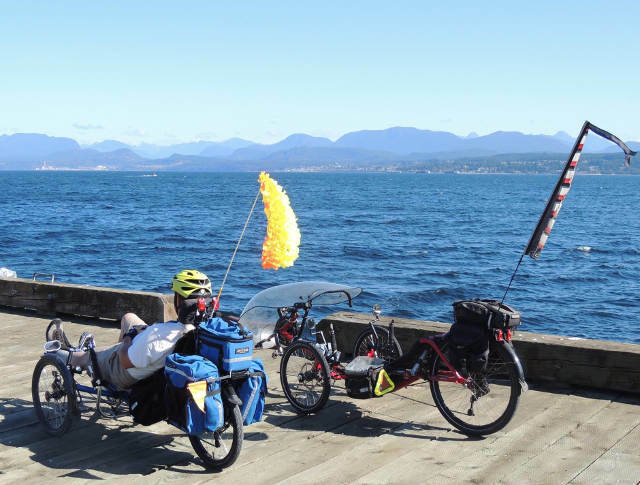 UPDATE, JANUARY 2017: Glen Aldridge now operates a tricycle adventure company in Canada, which you can visit by clicking the following image, or clicking HERE. A couple of days ago this huge box shows up at my drop ship location. Fortunately it was in one of my favourite colours. 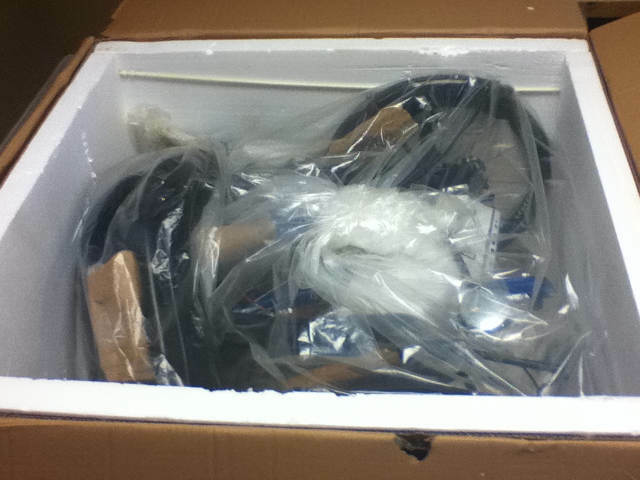 The contents were extremely well packaged surrounded by Styrofoam, bubble wrap, rolled up cardboard & zip ties. I was really impressed with the packaging job especially since there weren’t any marks or damage. After 20 minutes of removing the protective packaging I was able to retrieve the contents within – still more pieces to snip loose before I can start assembling. Ooh, looks nice – can’t wait to ride it! 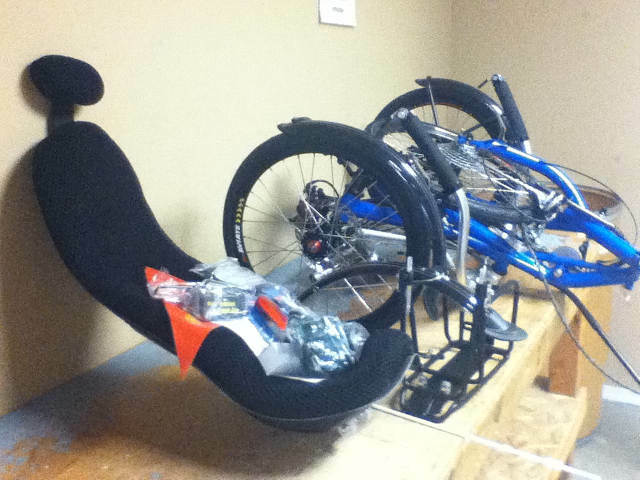 That new hardshell seat is calling my name. 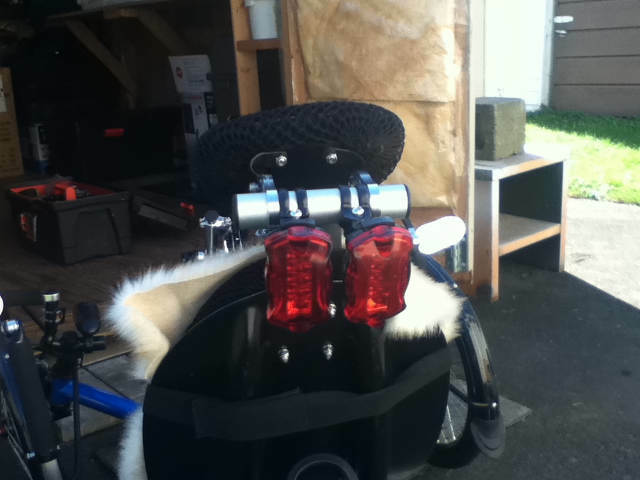 I added genuine fake Canadian Chipmunk for a seat cover until I can locate genuine fake sheepskin. I also added fluorescent Tennis balls as an added safety measure. We Canadians hang our water bottles from the bottom. 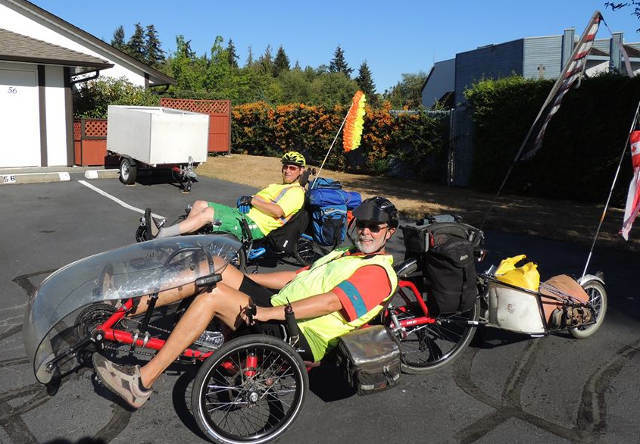 Thanks Tom, My new Transport 20 is a beautiful Trike & dealing with Trident Trikes is always a great experience. 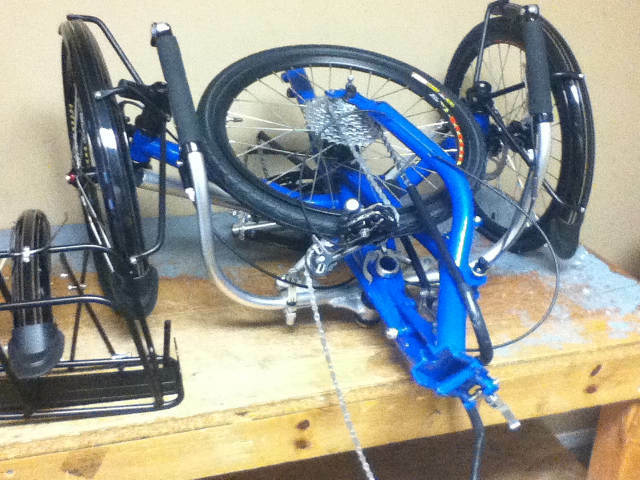 Notice the folding joint on the frame under the seat. 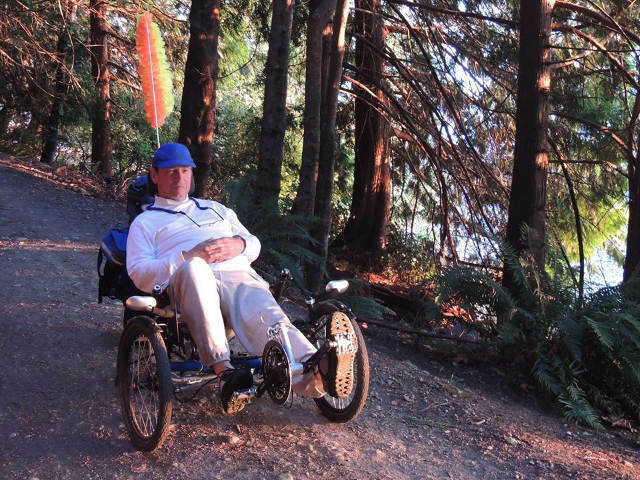 I was torn between waiting for Trident’s new Odyssey Travelling Trike coming out in October, or buying this one with it’s top components & track record. Since Murphy had a role in my previous Trikes I decided to go with this & forego the convenience of a suitcase traveller since so many hinges & points of movement might become a headache until a few refinements are made. So far I am enjoying this Trike & it feels rock solid although slower than my delta. This could also be break in time & get faster as things get settled in. It also feels considerably longer than my Delta at 67 inches compared to 72 inches but the steering is RIGHT NOW without any play or feedback from bumps or potholes. Braking is almost perfect with these new improved BB7’s. Previously, I could never get them set so they wouldn’t rub or grab & had sworn off Disc Brakes for good. Tom told me that up until about 2 years ago BB7’s had a few tweaking problems but they have resolved that now. I didn’t have to do a thing! They were perfect right out of the box! Speaking of out of the box, there was very little I had to do to get riding. I think it took me longer to unpack, unclip & remove all the packing then it did to do the assembly. 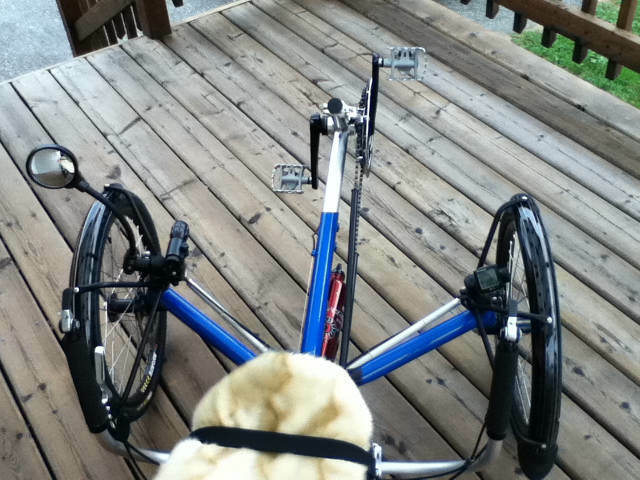 I had to install the boom, seat, rear dérailleur & rear wheel, install my Shimano spd pedals, inflate the tires & adjust everything for length, make sure all the bolts were tightened & I was off. 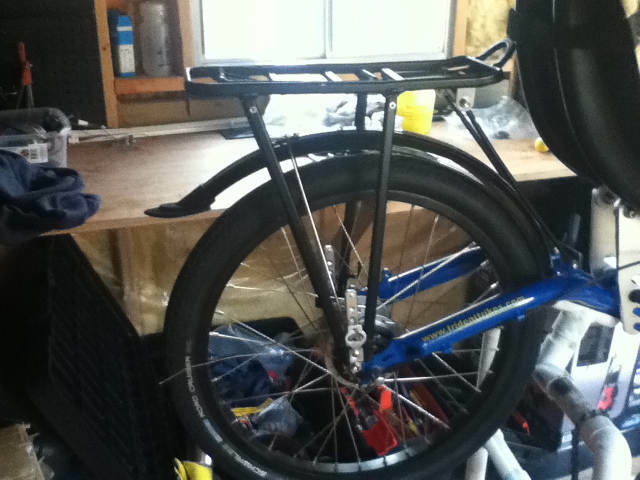 I left the rack, rear fender & accessories until later, I was ready to ride! 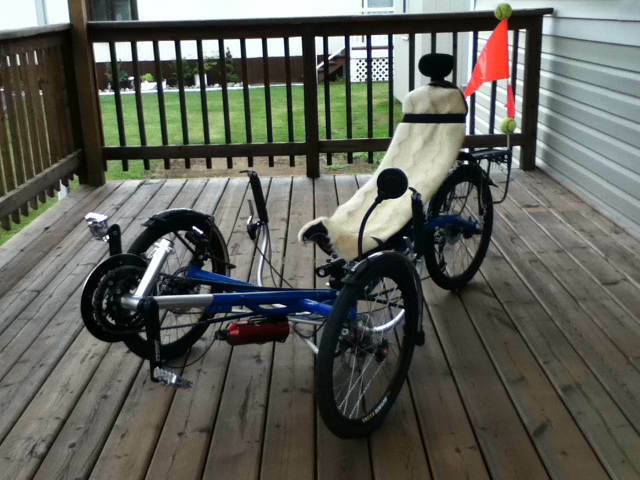 What has really impressed me about this Trike is that everything works. I had come to expect a few issues with new product purchases, needing missing parts or things not quite right as being the norm. I was missing a Boom Nut. Had the bolt but no nut & washer. I was also missing one of those plastic end tube caps. Amazingly, I had all necessary spare pieces in my assortment of Yogurt containers that I keep for just such an occasion. The other deciding factor was time. 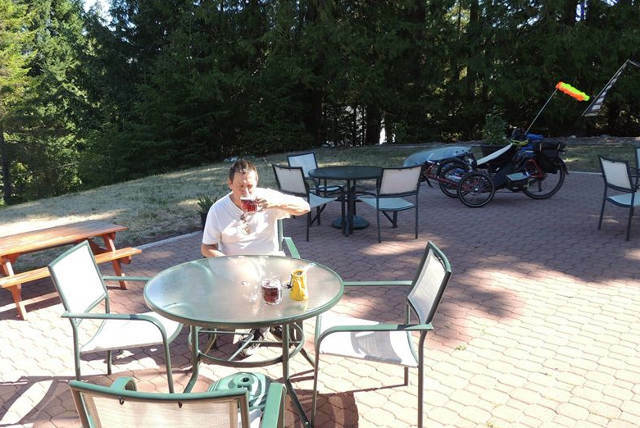 I have been working on my Trike Tours for about 2 years now & I think have all the bases covered for costs, liabilities, venues, trip durations, meals etc. Up until this time building my Delta was giving me skills for making things work, improvising where necessary & also the confidence to believe in myself that I can do anything I set my mind to. So while my Delta is not perfect, it is a pretty nice final product. Even Mr. Steven T. likes it. Although it could have been much better with his skills & knowledge. 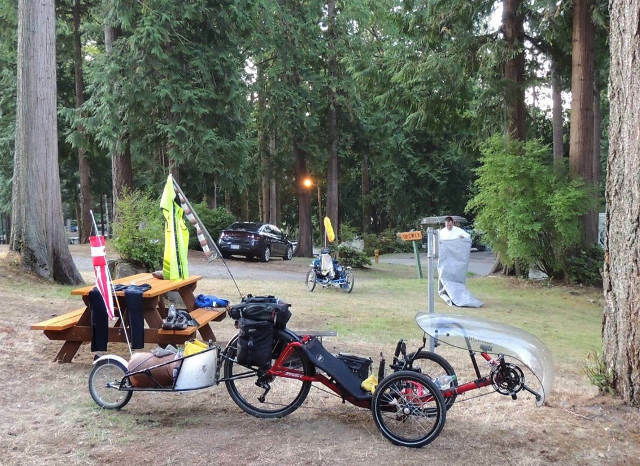 So now I move on to my next project, getting DAYTRIKERS up & running using 4-6 Tadpole Trikes for sub 72 hour excursions through wine, waterway, camping & tourist areas. Now you know why I came over to the dark side (tadpole trikes) – I need a bulletproof trike & I think the Tr20 is just the trike for the job. Usually on Canada’s WET Coast we complain about the cold, wet weather. On a good Summer we might get 3 or 4 weeks of decent sunshine with temperatures in the high 20’s (75 F.) Not so this year. This Summer has been the best I have seen in 30 years of living out here & with fall the sunshine seems to be hanging around for a few more days. Since this area is blessed with such scenic beauty, the western edge of The Rockies, The Fraser River, valleys & streams where the salmon run it seemed not taking advantage of this unusual weather blessing would cause me to curse & complain all Winter long when the overcast skies & rain finally do sock us in for the duration. 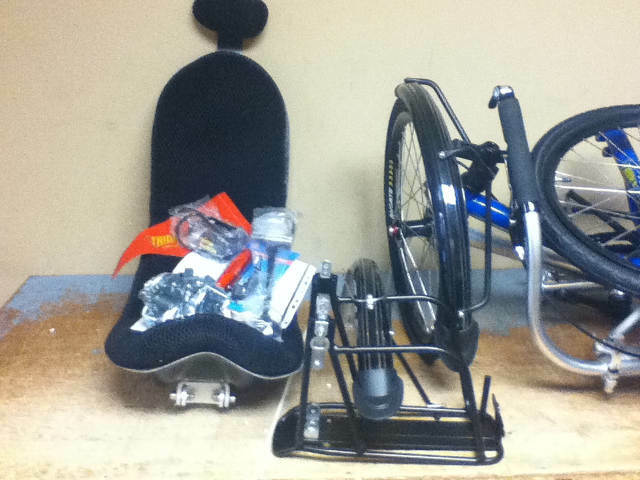 Besides, I needed an excuse to get my new Trike on the road. 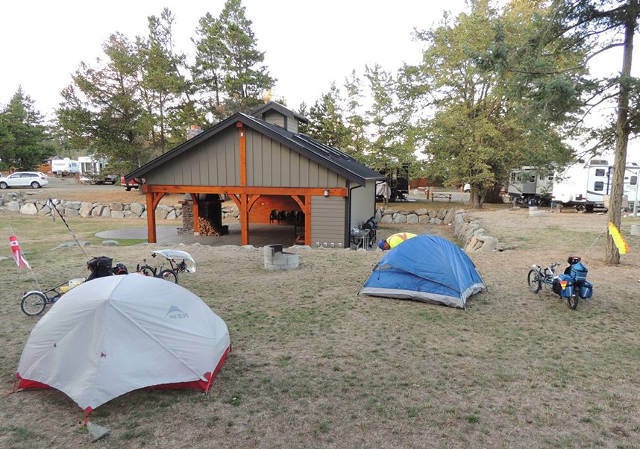 Part of my plan was to spend the weekend going from Agassiz to Hope, BC & returning Sunday evening. A total distance of about 70kms. or 44 miles. Certainly not an earth shaking distance but with a few good climbs & rewards on the down side this was really a shake down trip to see what changes if any I have to make to my trike still in it’s factory stock condition. As I would be riding with the stock gearing of 30/42/52 chain rings, I new my low granny was going to give me 17 G.I. and for my old legs I wasn’t about to go fully loaded. As it turned out I only had to use the low/low for short distances near the peak of a hill & I suspect that was due more from lack of conditioning instead of the trike not being geared properly. 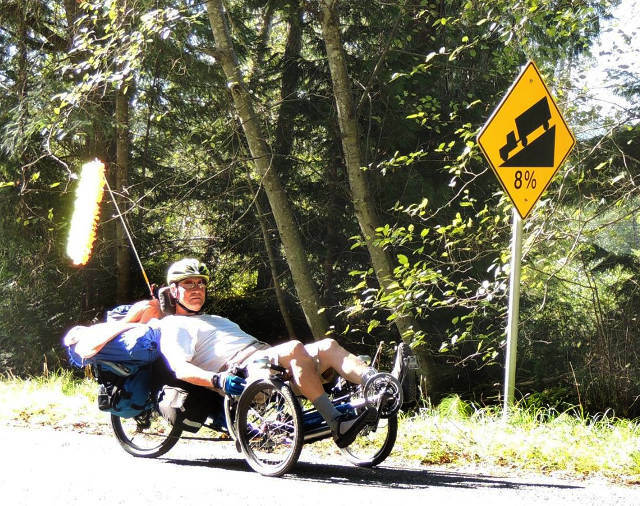 Leaving Agassiz about 10am I was surprised just how heavy even a few things can feel on your trike. I had only packed a change of clothes, rain gear, a little food & my tool kit, not much more than 20 lbs. I would guess but it might as well have been an anchor once my legs started cramping. This area has such beautiful scenery, I was taking my time, taking photos & just enjoying the ride. 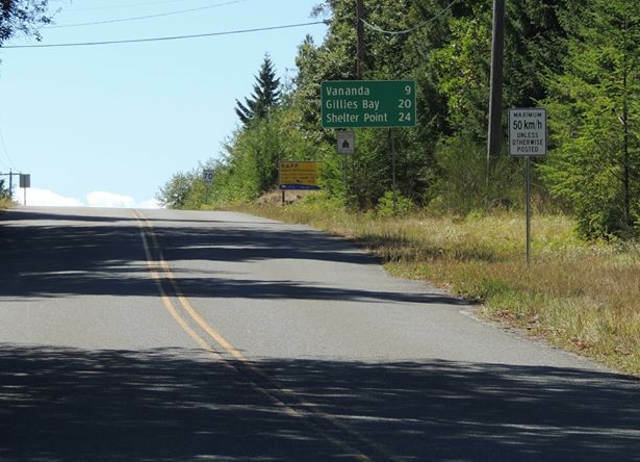 I was struck by just how straight & flat Hwy. 7 eastbound is until you get to the first hills, then I was struck by how bloody long the inclines were. Of course knowing I would be hitting my top gear cranking on the speed.returning the same way was consolation enough. One of the oddities of Micro Trips are the characters you run into. Whenever I go on a weekend or short out of town trip it is almost guaranteed that I am going to run into a character or two just to make the day interesting. This weekend wasn’t any different. First rest stop I am making myself a coffee & a snack when these old guys on Harleys & Gold Wings stop by. 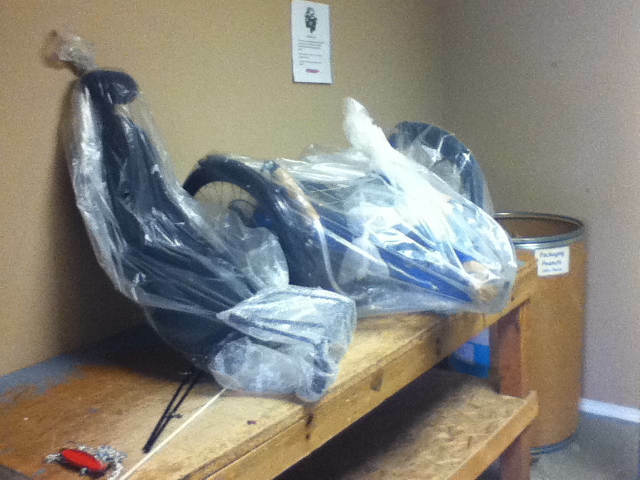 Turns out they were more interested in my trike then their $30,000. machines. haha One guy thought I was crazy riding on the Hwy. with so many maniacs on the roads. Once I explained to him that trikes garner more consideration from drivers than 2 wheelers he seemed consoled. A few miles later a young lady sitting in the parking lot with her dog wrapped up in a blanket was being very friendly, asking me about the trike, where I was from – you know the usual bystander questions. She was waiting for the Police since her Boyfriend had kicked her out of his truck 30kms in the Bush & drove off. Some how she managed to get back to civilization. I also came across 2 kids about 10 & 11 years old walking in town. Nothing unusual about that except that I saw them 2 hours later on the Hwy about 10 miles from town still walking on the Hwy. I tried to make conversation with them thinking they might be runaways but they weren’t having anything to do with this old man. What a crazy world we live in. One of the concerns I have had for the tours is beginners having shifting problems or worse getting the chain jammed mid ride. To alleviate this possibility I had decided to use Shimano Internal Gear Hubs. Using these on Spikes, the trike chosen for the tours seems to be an unknown since I haven’t been able to find anyone that has done the conversion. 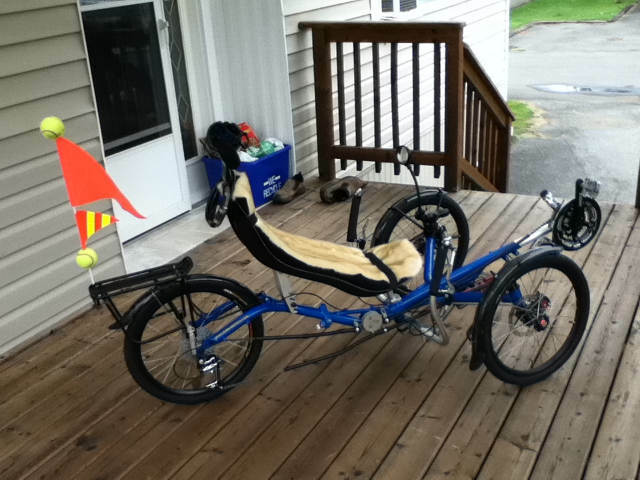 So this weekend I decided it was time for some experimenting with my trike since I had a few upgrades to add anyway. First up was the Rack. The Transporter comes with a nice beefy rack but it struck me as hanging off the back of the trike. It also didn’t accept my Lone Peak 500 Touring Bags very well so it was replaced by this generic model that seems to sit much better on the back & takes my Panniers well. Only problem is I have lost my flag tube. Next up was my Right Side Accessory Mount & Mirror. These mirrors are the best I have ever seen. Made from a single piece of Billet Aluminum they have a Lift Assist Handle built in & are rock solid. To get a little rise above my fender I cut down some old Bar Ends but these need to be about 4 inches in height. Next was the Tail Lights. I have never liked mounting tail lights down low on the rack, I prefer they are mounted closer to a drivers line of sight so I modified an accessory Bar to fit my Neck rest & used a couple of aircraft clamps. 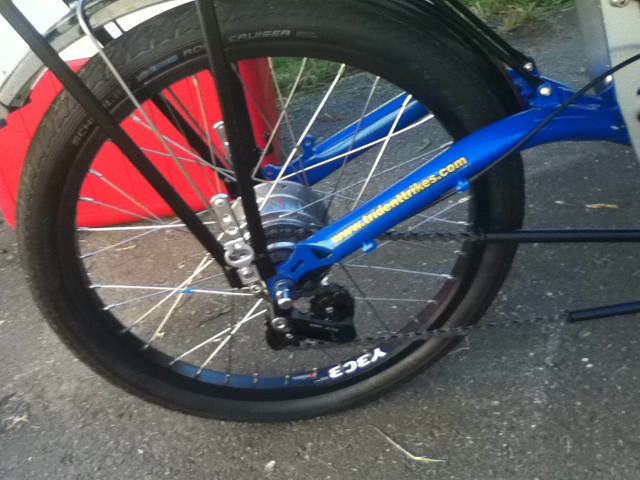 Lastly, I installed the Shimano Nexus 8 speed Hub. Now this was an exercise in patience since I was starting from unknowns. I had to remove the old wheel with the cluster, the rear dérailleur, install the chain tensioner, re-route the chain through the tensioner & front dérailleur. Then I had to flip the IGH cog so it lined up with the chain line of the tensioner, install the cassette lock nut at 83mm instead of the recommended 101mm. 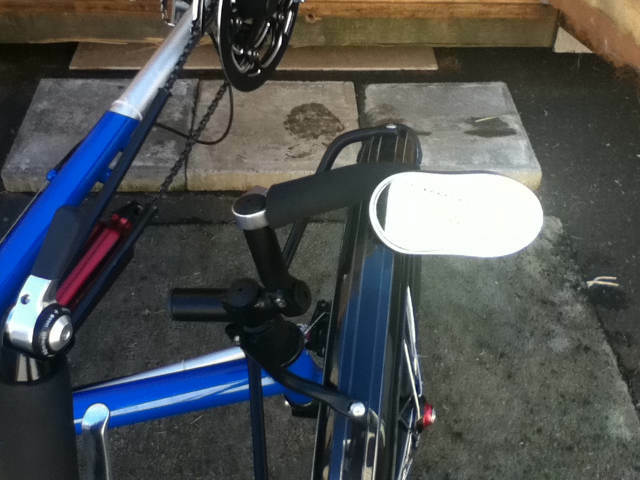 The end result is I can use the stock gear cable & shifter. I didn’t even have to change the chain length. I now have 24 usable gears without any fear of cross chaining, jamming or having the chain drop off the gears. It still needs a little tweaking & I may end up having to switch to a Shimano specific Gear Changer since the detents seem to miss on gear 6. All the others seem to be right on. 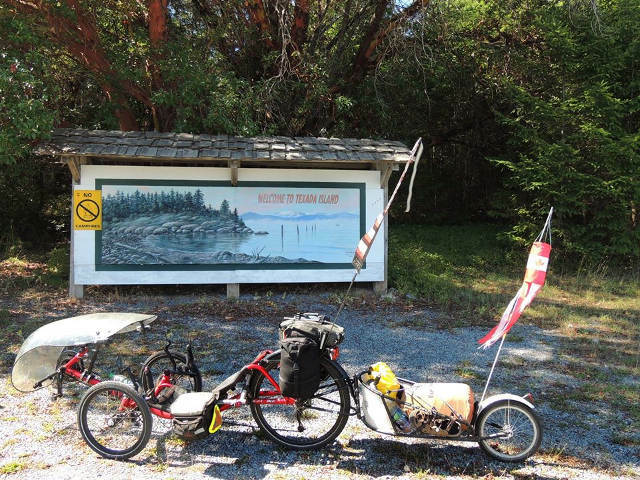 Here are photos and explanation from our trike tour to Texada Island, between Vancouver Island & the Mainland, in Canada. 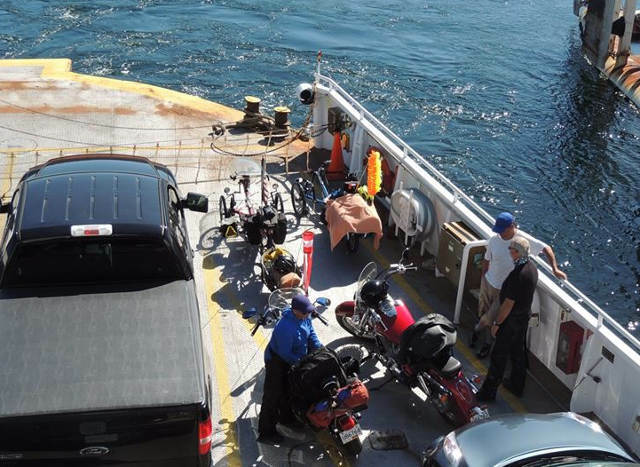 The trip included several ferry connections, lots of hills which all seemed to go UP, a near miss with a cougar, a couple of new records for me, 235kms & fantastic weather…….IN CANADA! #2- Why is it my hills are always UP? 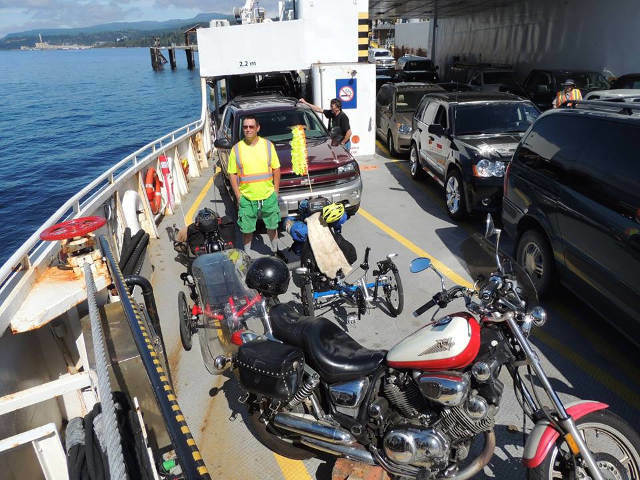 #5- After arriving on Texada Island we were greeted with this 8% – 1 1/2km Monster that I called Hamburger Hill since that’s what my legs felt like in the heat. 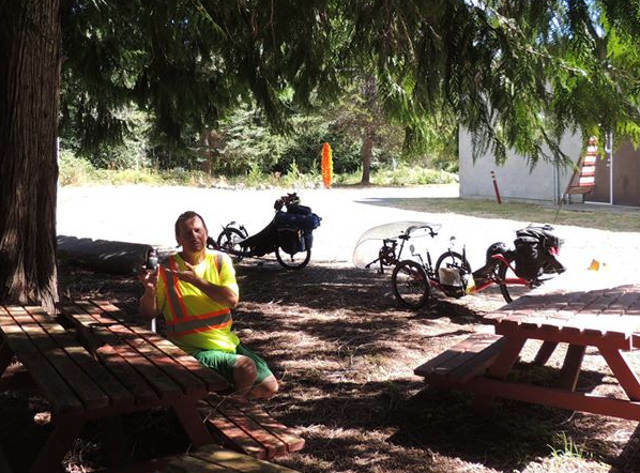 #12- A trip all too short after breaking 2 personal records – 80kms/hr. & my first metric century.